Remember these crazy furs I blogged about this year in New York? It seems that fantasy fur in interesting – and often whacky – patterns and colors are now hotter in New York than the classic “old-Hollywood-style” furs. You might call it the more conservative approach. Instead of going out and buying the latest multi-colored, multi-textured fur, women seem to be pulling out of their wardrobes their coveted luxury furs and wearing them with super casual clothes – the ultimate hi-low dressing! But seriously, I find it a cool way to show different facets of a woman’s personality: a soft, opulent fur with cazh leggings and moto boots – or distressed denim and sneakers. I did see one or two Londoners using fur to make an entirely elegant statement. Take for example the woman pictured below. Don’t you love how she compensates for a spring-like dress and bare legs in wintery temperatures by being extra insulated on top? (I wonder if it works.) The studs on her booties keep it from being too prissy, however. Although I spotted a few more wildly patterned furs, they were in more muted colors than I saw in New York. You may recall a shot in our post about New York Fashion Week featuring a traditional fur coat with Converse. 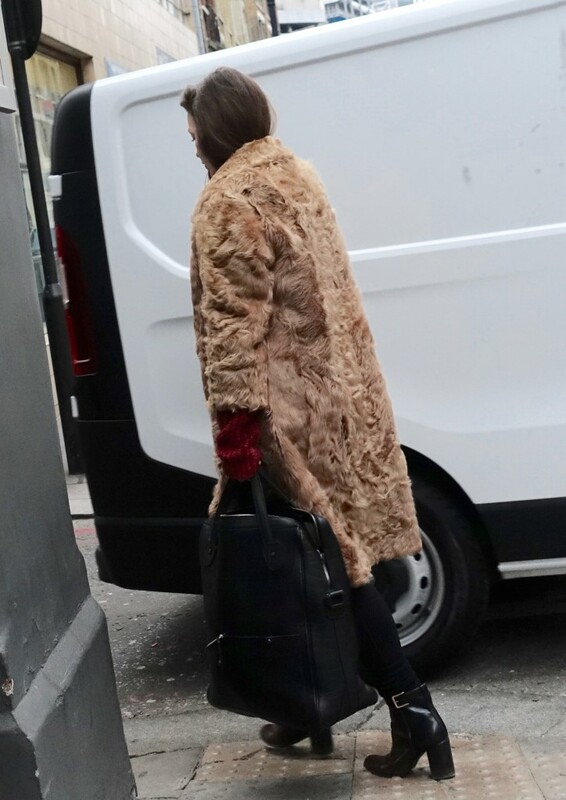 So this look is not exclusive to London, but I definitely saw more women combining classic furs with super cazh garments there. And I thoroughly enjoyed it. Which way do you prefer fur styling – a la London or New York? My favorite look is the NYC lady who is wearing the grey 3/4 length sleeve fur coat with the grey cheetah print sweater layered underneath! I can see why you chose that one, Melissa. Her ensemble seemed very thoughtfully (and skillfully) put together. ???? Oh the furs look so cool!